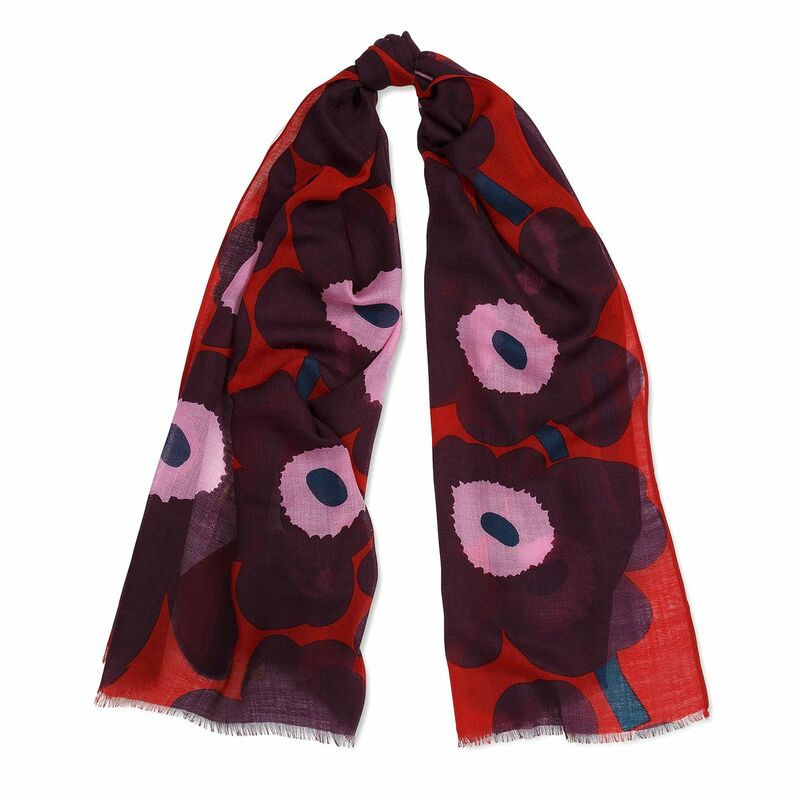 More about Marimekko Unikko Red / Plum / Pink Fiore Scarf The Marimekko Unikko Fiore Wool Scarf is a versatile accessory; it can be worn a number or ways, with many outfits, and during different seasons. Maija Isola's iconic print wears rich shades of red, plum, and pink on soft and sheer 100% wool. Raw edges give it a cozy and casual look, no matter how it's tied. Care: Hand wash. Follow instructions on tag. 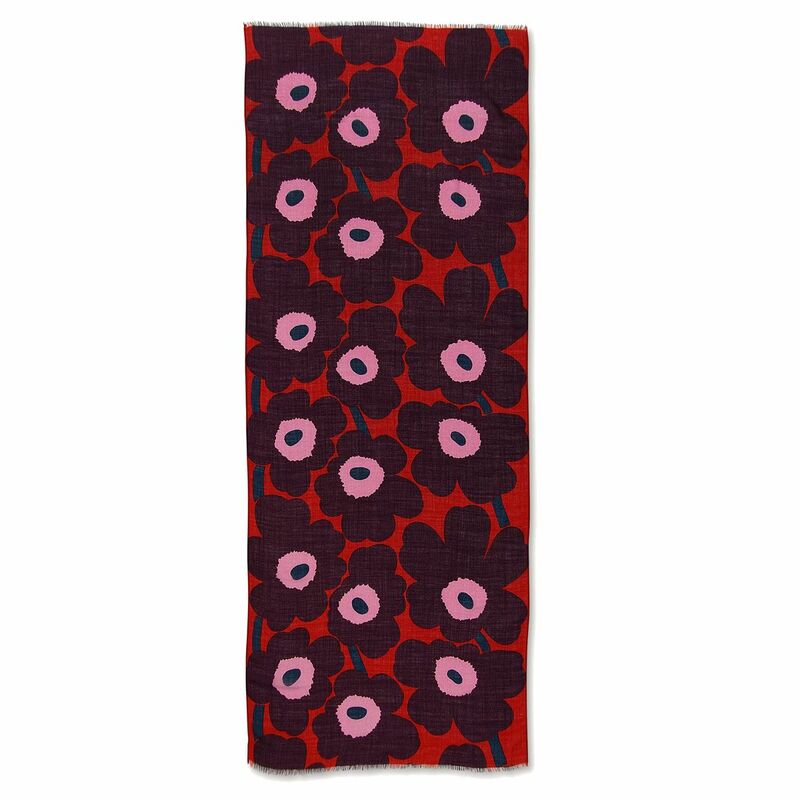 I came to Finnstyle to replace my black-and-cream Marimekko Fiore scarf after it fell victim to a laundry disaster courtesy of my well-intentioned mother in law. And while I was delighted to be able replace that one, I also found several additional lovely colors, including this version. The red/pink/plum colors here vibrant and great on a gloomy winter day. And I already knew what to expect in terms of size and construction, which is why I was happy to order more. 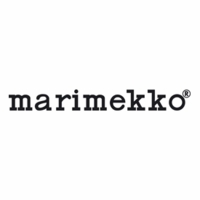 Marimekko makes my very favorite 100 percent wool scarves. 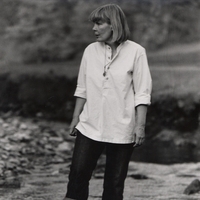 They are lightweight but warm, and generously sized without being bulky. And not scratchy or itchy at all. Just don't let anyone throw them in the wash on hot and then in the dryer - they turn out beautifully if you wash them on cold, delicate cycle and line dry! ProsLightweight but warm and not itchy.